Transmits /Receives With Four Multiplexed Antenna to Cover the Larger Space and gives a High performance on multi-tag reading. Energywin RFID Reader is based on improved Generation 2 RFID. The reader is compatible with multi protocols and is designed to connect with a multiplexed four antennas interface. It is also programmed for faster reading, multi tag identification with a standard industry grade protective enclosure. 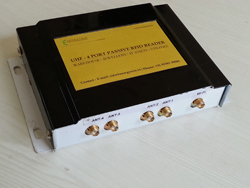 Compatible with EPC global UHF Class 1 Gen 2 / ISO 18000-6C. Four High Performance Antenna Ports. Capable of High efficiency and multi-tag identification. Multiplexed antennas to cover Larger Space. Wifi Capability to connect to existing network (DHCP/Configurable static IP) or Creates Own Network to allow users to connect. Web Server for online data verification / Local Data verification tool. Local Configuration tool to allow users to modifying the Settings.